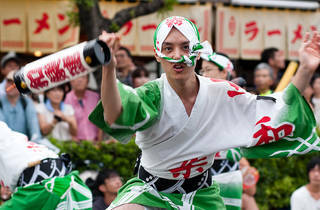 12,000 dancers pile out onto the streets of Koenji over the two days of the annual Awaodori, undoubtedly one of Tokyo's most energetic festivals – and one with crowds to match. 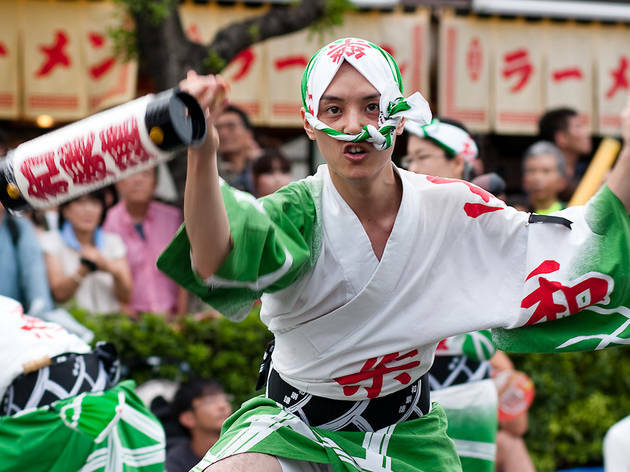 The awaodori ('awa dance') tradition can be traced back to Tokushima in Shikoku, where the story goes that the local daimyo plied his citizens with booze to celebrate the completion of the local castle in 1586, leading to a citywide outbreak of dancing in the streets. Whatever the accuracy of that tale, the enthusiasm was contagious, and Koenji has been holding a dance of its own for over half a century. The event got shunted to an afternoon slot last summer due to concerns about electricity, but it's more-or-less back on schedule this year – and while the action starts at 5pm, you'll need to arrive much earlier if you want to snag one of the best viewing spots.